Let’s celebrate a rainbow of spiritual practices! I can’t wait to share some of Santa Fe’s most beautiful sacred sites and traditions with you during “Sacred Santa Fe”… a magical adventure in Santa Fe and surrounding areas, December 11-16, 2018. Immerse yourself in the natural beauty and spiritual ambience of New Mexico during the Season of Light. We’ll travel by day to sacred sites and artists’ galleries including a rare visit to the Pojoaque Pueblo on their Feast Day. 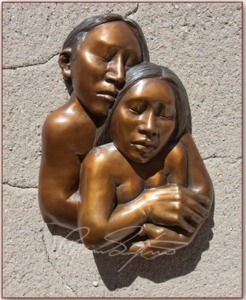 There we’ll meet sculptor Roxanne Swentzell for a private gallery tour. Here’s one of her magnificent works of art called “Held”. We’ll return to IHM retreat center owned by the Carmelite sisters for fabulous food and joyous interactive evenings together. You will have ample opportunity to delight in unique holiday shopping opportunities—affordable and beautiful New Mexico crafts, art, clothing and more. ONLY 5 SPACES LEFT – PLEASE REGISTER NOW TO SECURE YOUR PLACE. Give yourself the holiday gift of this celebration of spiritual diversity in the company of like-hearted people… I’m so looking forward to sharing this beautiful experience with you. 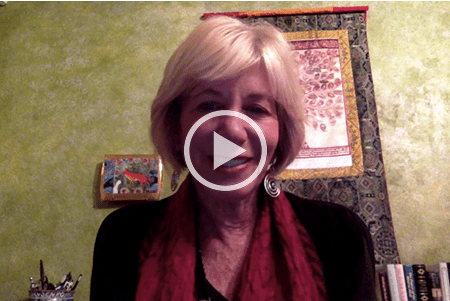 I have some great news, and also a video invitation to come and join me, and my heart sister Gilah Rosner, for a delicious self-caring retreat in Santa Fe, NM this coming September 13-17. The retreat is over half full, and to make it easier for you to attend we decided to extend the Early Bird Rate for another two weeks, through May 31st. The reason? I’ve been so preoccupied preparing for my double hip replacement June 19 (yikes! ), that I didn’t get around to putting out much information about the retreat. By the time we get together in the Land of Enchantment this September, I will leaping tall buildings in a single bound. Or at least able to cross my legs again. Seriously, I’ll be in great shape, back to hiking in our magical mountains, and waiting for you with a grateful heart and strong body. Science rocks, and so does a healthy Body, Mind and Soul connection. I would, by the way, appreciate any healing energy you might be moved to send for a safe surgery and a speedy, uneventful, and excellent recovery that leaves me strong and flexible. Want to know what the Self-Caring retreat is all about? Watch this little video invitation I made for you. It was such fun!! If you want a full description of the retreat, check it out here. P.S. In the video I gave the wrong dates… oops… it is indeed September 13-17, not the 12-15.